Comprehensive Simplified PPC Data revolutionizes performance planning speed and accuracy. Complete your performance planning in a snap! Logical Flow Diagram Procedures. Refresh your memory, work your planning and performance considerations step-by-step through a concise decision tree. Integrated with other Pubs. The latest TM 55-1520-210-10 (C17) data are integrated with guidance from other publications i.e. 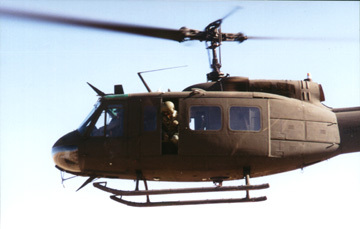 AR 95-1, TC 1-211 and CFR's etc. Tabbed Indices organize procedures and data the way you actually fly; TAKEOFF, CRUISE and LAND. Also provided are LIMITS/SPECIFICATIONS, IRREGULAR, EMERGENCY and ADDITIONAL Procedures and a PROCEDURAL INDEX. Conveniently Sized to the "-10CL". 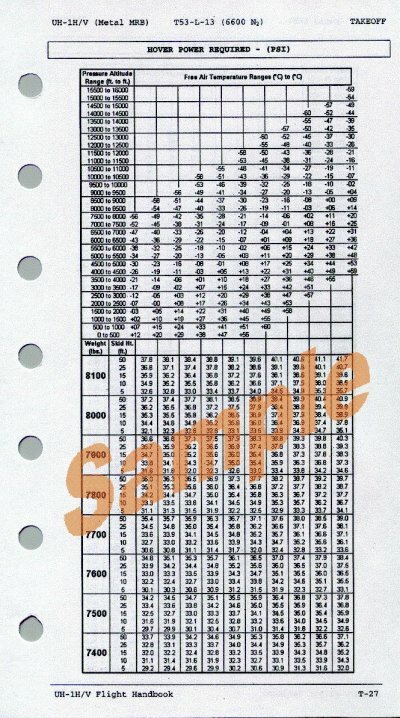 More than 300 heavy durable pages measure 4.5 x 8 inches. 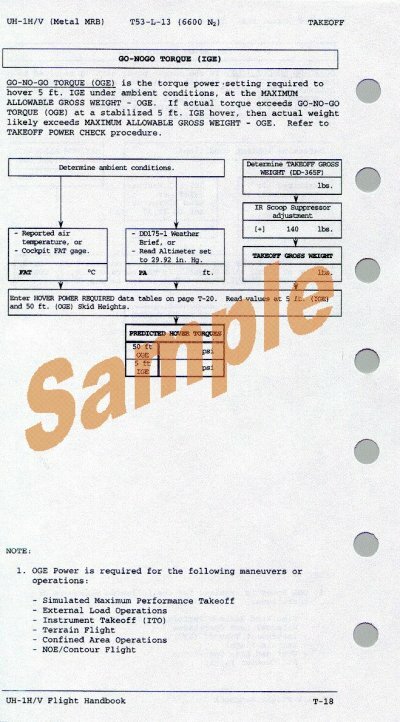 Seven pre-punched equally spaced holes allow the handbook to be "ringed" just like the "-10CL". Two Handbooks in One. Performance data covering both Composite (CB) and Metal (MB) Main Rotor Blade (MRB) aircraft are "color coded". 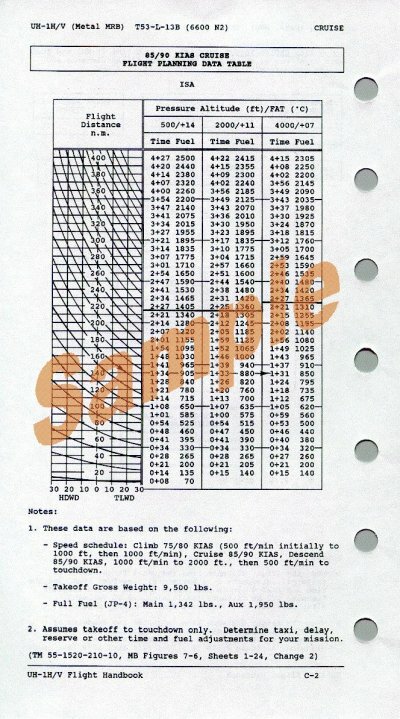 Each page clearly indicates aircraft designation, power plant and data basis. Completing the Performance Planning Card (PPC) can be time consuming and tedious, but not any more. 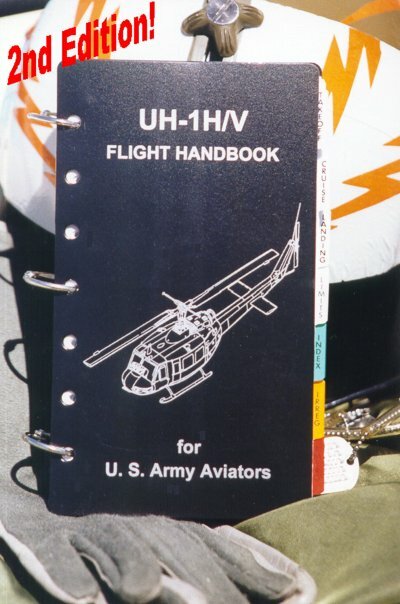 The UH-1H/V Flight Handbook For U. S. Army Aviators is a Quick Reference and Study Guide developed by an Army Aviator for professional aviators rated on the UH-1H/V (commercial designations Bell 205 or GH-205) aircraft. 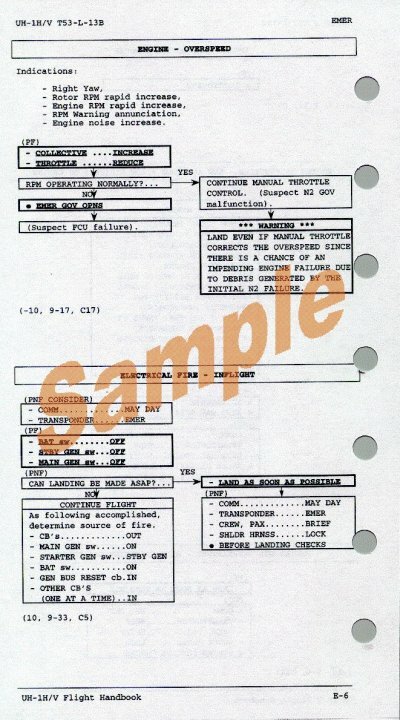 Procedure Header clearly states objective and first paragraph defines subject. Identifies arguments, or parameters and dimensional units. Includes reminder for adjustments, directs you to proper data table and defines values to be returned. Now includes intermediate Skid Heights, 5, 10, 15, 25 and 50 ft. Gross Weights in 200 lbs increments. 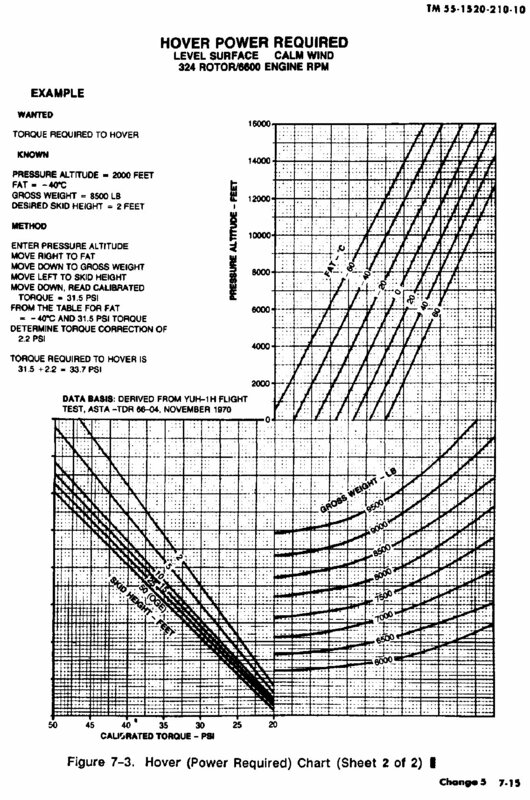 Torque is displayed to the nearest tenth of a psi. Emergency procedures follows -10, Chapter 9 immediate action steps.